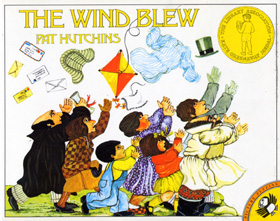 It’s the middle of Autumn and the cold windy weather these past few weeks is the perfect reason to read The Wind Blew by Pat Hutchins. In this story all sorts of things are whisked away by the wind as more and more townsfolk chase their belongings through the streets with hilarious consequences! Make a paper kite and see if you can make it fly! Collect some autumn leaves and talk about their shape, size, colour and texture – you can use them to make a collage or put on your gum boots and kick them around the yard listening to the lovely crunchy sound they make as they rustle around. Give your child a description of something in your home and ask them to pretend to be the wind and go and find what you have described. Develop print awareness skills by pointing to the words as you read them, and talk about the parts of a book such as the front cover, the title page, and who the author and illustrator are. Learn about irregular past tense verbs like ‘blew’, ‘caught’, ‘lost’, and ‘ran’. Emphasize the words with your voice to highlight them as you read the story and see if you can remember who lost each item at the end of the story. Have your child finish off the phrase ‘the wind….. (blew)’ which is repeated over and over during the story, and by the end of the book see if you can pause and have your child repeat the whole phrase!